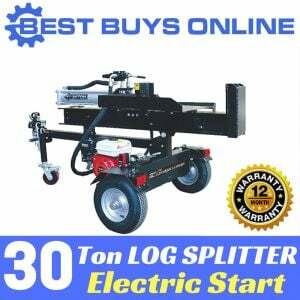 The 30 Ton HEAVY DUTY LOG SPLITTER is one of the most powerful, superior and reliable log splitters in Australia. More than 100 items sold over the past 12 months. It has a compact and innovative features to give its best performance. 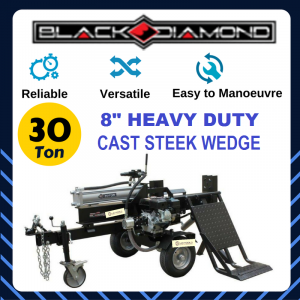 It comes with the impressive 8""(200mm) hardened steel splitting wedge to slice through the toughest of timber (while most of the machines on the market has 150-180mm height wedge only). The new model comes with Jockey Wheel, Side Table, which gives you extra spaces to storage multiple timbers and easily move it around your property. One of the greatest benefits of this product is its 6.5HP engine petrol powered operation. 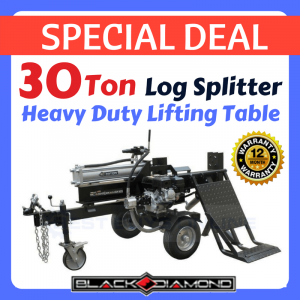 So, why not stop a backache out of chopping firewoods and let the LS30 help you? • Direct drive with flexible couplings, Coupler size: 50mm cast steel.